Samuel Beckett wrote a number of absurd and darkly comic plays that investigate the human condition and our place in the world. Happy Days, currently running at the Royal Exchange Theatre, was written in 1961 and remains particularly obscure and complex. Like a piece of experimental film, this chamber piece presents a surreal situation to make deeper points about timekeeping and existence. 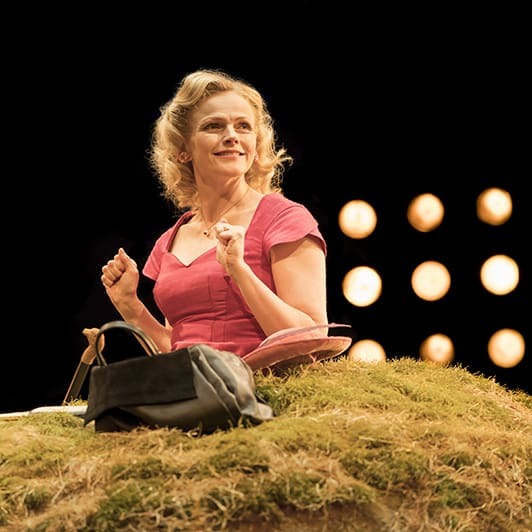 Maxine Peake plays Winnie, the motor-mouthed protagonist presented, without explanation, buried waist- then neck-deep throughout. The only other figure is her husband, Willie (David Crellin), lethargic and reclining just out of her sight, who occasionally speaks up to answer her incessant questions. We never find out why she’s there, but it reflects the experience of people trapped by anything from ageing and relationships to day-to-day life, using the façade of a well-practiced routine to cover their discomfort and worry. Winnie’s show through the cracks more and more as the play goes on. She rushes and repeats herself, and Peake does a great job of maintaining a frantic, fractured positivity throughout, even when just her face is visible – an impressive job given that the play is almost a total monologue, lasting around two hours. 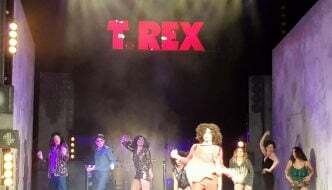 This production uses the unique in-the-round nature of the Exchange’s main stage to its advantage. The mound Winnie is held in place by rotates in the centre. As the world continues to turn relentlessly, so does the stage, with Winnie trapped helplessly at its heart and Willie free, but unwilling to leave. However, no matter how well mound and round go together, some audience members might feel cheated by having the action, what little there was, obscured half the time by the great lump of set taking up centre stage. There was rarely a point when the actors’ words were obscured, however – apart from after a couple of unfortunate technical issues. Tension and disquiet is maintained by the ambient light and sound, with regular piercing alarm bells and blinding lights giving the idea of time progressing, slowly but unstoppably. As a play, the confined nature of its setting makes it difficult to ad-lib on. Still, it felt like in this version, there wasn’t a lot of new life breathed into the conceptual and admittedly restrictive work. Happy Days is neither comfortable nor easy to watch, and it isn’t meant to be – it challenges the audience and would be hard to recommend for casual theatre-goers in search of a gripping story or passionate scenes. But if you’re looking for a visual spectacle and multi-layered text that’ll have you thinking about deeper meanings, it’s got most of the right ingredients. 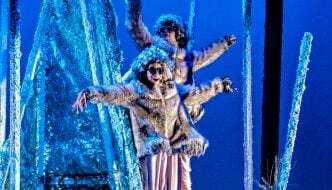 At times shocking and frustrating, but definitely unforgettable, Happy Days makes its points with flair, but takes no steps to bring any new sensations or surprises to the avant-garde play. Happy Days runs at the Royal Exchange Theatre, Manchester, until 23 June.